Its early wednesday, I’m at Long Beach for LSSC11 – the main US conference for the Lean Software Systems Consortium also at LimitedWIPSociety.org – the community practicing and leading Lean and Kanban in software development. The main conference starts this morning and my talk is this afternoon, but so much has happened already, I’m really glad I arrived early. So what are the reasons to arrive early to LSSC conferences? 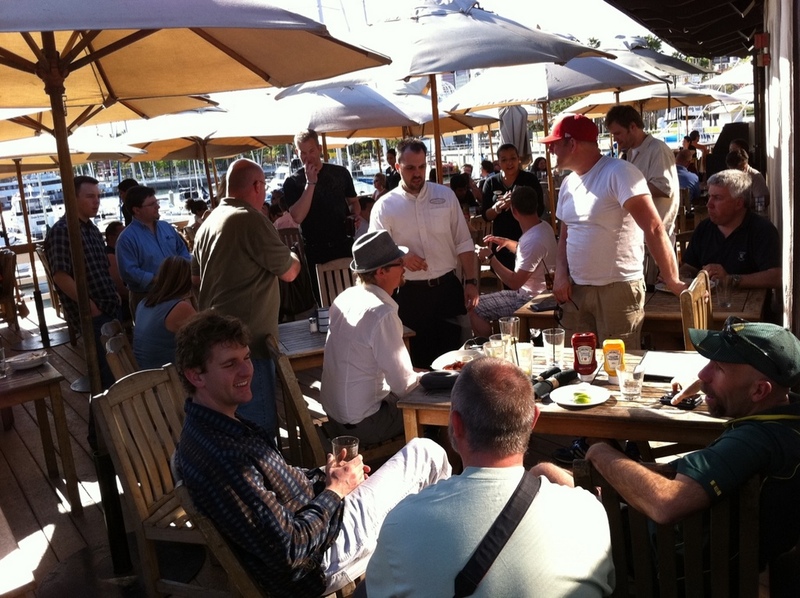 Socializing with other participants – Starting monday afternoon and into the night, already had the opportunity to catch up with friends, meet twitter friends f2f, and meet new interesting people. This makes the discussions and collaboration that happens later on much smoother than arriving just in time for the first session. And of course had the opportunity to try some beers, and have great dinner. The slack time before the conference allows great discussions to take place. One typical discussion was commitments, estimates, what various teams are doing about it. Had this discussion with Liz Keogh, Ted Young, Larry Maccherone. We discussed the various contexts where estimates make sense and don’t, the difference between estimates and commitments at the team level and the customer/business level, and how to combine them. The pragmatic context-driven discussion appreciating the need to take the principles we agree on and apply them differently based on the scenario is very typical of the discussions the Lean/Kanban community has, and why I’m so proud to be an active member of it. I had a chat with Dennis Stevens about PMI, Scrum Alliance, some of the directions we think our community should take, and the opportunity that is there to affect a much wider portion of the business world than we currently are. Looking forward to discussing the PMI angle specifically for Israel and AgileSparks some more with Dennis once Inbar Oren joins us today. Also had a chat with Rowan Bunning from Australia about styles of coaching and exchange some experiences in general. Well, you can see in the picture we had an interactive session. What was it about? Identifying the Challenges, Opportunities and Actions we want to focus on as a community, and setup the baseline for a Community Participation Program that will drive the LSSC community forward. There were a couple of threads and I will not go into all of them since its becoming almost time for breakfast and to leave some suspense for later. 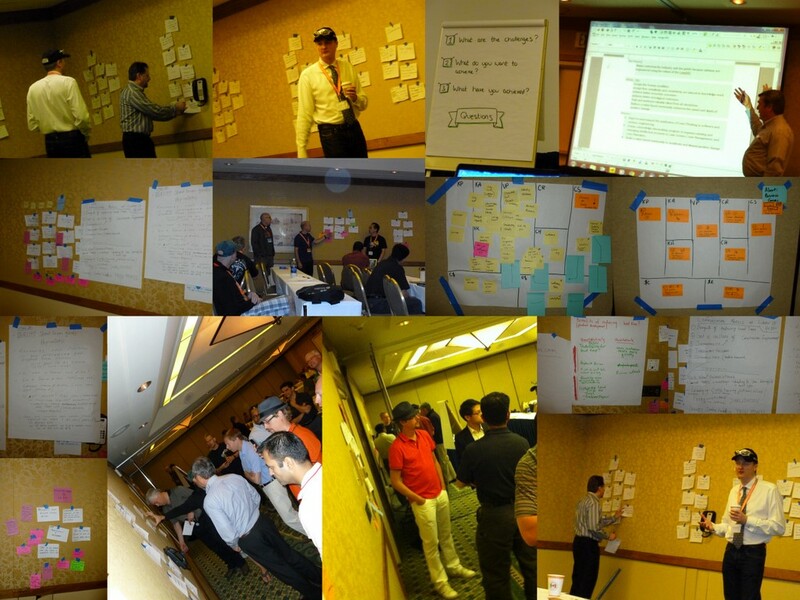 But I was mainly focused on the challenge of educating the world out there about Lean/Kanban for IT/Technology environments, essentially establishing and promoting our “Brand”, and the opportunity we have as a community to make it happen. Ryan Martens suggested we do a Business Model Canvas taken from Business Model Generation which seems to be a book I should look at. Karl Scotland, Jason Yip, Eric Willeke and myself had some great ideas on how to evolve the business model of the LSSC. We identified various constituencies that the LSSC can cater to, and focused on Corporate members and Vendors. For me, the Vendors discussion is where we shined. We have some practical ideas on how to make the LSSC more viable as well as more effective in promoting the brand. We are hoping to generate discussion around these ideas with the vendors here in LSSC this week, as well as with the LSSC Board, and see how things move on. After the TAB finished, I had the chance to have a long and interesting discussion with Don Reinertsen, about Transition Styles, What he typically sees in Mixed HW/SW environments, how to make his approach and ideas more palatable for non-Engineering folks (e.g. MBAs …). We also discussed some ways to collaborate in the future. Then it was time for the welcome reception. Free Food, Drinks, Riot Games – a sponsor which knows how long (or short) to talk at such an occation, and mainly more discussions and meeting even more people. I had the chance to sit down with the LeanKitKanban team for a chat about Agile Israel 2011, Talk to Allison Vale and Rodrigo Yoshima about Scaling Kanban to the entire business and how the israeli and brazilian lean/kanban/agile communities look like, as well as talked to Hillel Glazer about some interesting things we want to do together and learned some more details about his work with the Cutter Consortium. Turns out Israel generated some traffic after I directed some people towards one of their new Kanban papers written by David Anderson and Arne Roock. Tired from a long day and jetlagged, I retired to grab a quick bite and to sleep. Needless to add, still jetlagged, but very excited about starting the actual conference today, and my talk. Off to the showers, breakfast, see you on twitter on hashtag #LSSC11! 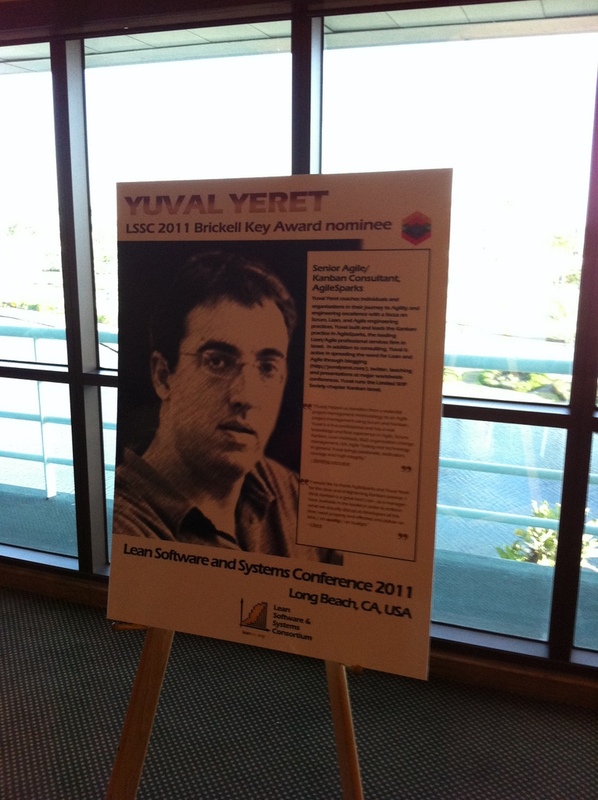 This entry was posted in kanban and tagged kanban, lean, LSSC, LSSC11 on May 4, 2011 by Yuval Yeret.